I think I may have gone a little sale-crazy over Christmas, but there were some amazing bargains around! 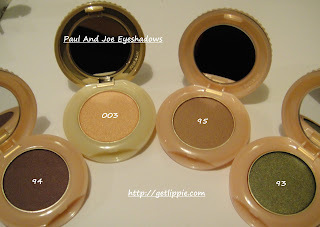 I was in Fenwicks last week, and picked up four Paul and Joe eyeshadows for about five pounds each! 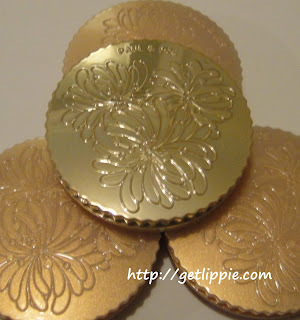 I love the packaging, they remind me of chocolate coins! From left to right, there are shades 94 (gorgeous velvety purple), 003 (peachy gold), 95 (rose gold/taupe shade) and 93 (mossy golden green). The shadows feel buttery soft on the skin, but I’ve not worn them on my eyes yet, as I’ve been ill, and wearing make up has been the last thing on my mind recently! Please excuse the broken fingernail on my ring finger there, I had a little altercation with a tin can over Christmas, and it’s only just growing back! 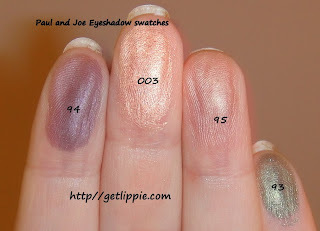 All these colours have a very metallic finish, and this is how they looked after one swipe on the pan. Am really liking the look of 95 there, I’m really looking forward to using these babies! Oh I want that green. Ceona, It'd suit you right down to the ground! They look really pretty,I have just ordered some Paul and Joe myself (never tried it before)as I keep hearing raves about it. Oh these are gorgeous! Especially the green and the purple! Whats the chance they will have any left?? Damn that packaging does look really nice;kinda art deco if you know what I mean. Do you know where else you can purchase these (besides the internet)?